We met Emma at the Horniman Museum Gardens. Through our usual consultation process, we got to know Emma and discussed her personal preferences and the wedding she was looking for. When we found the bride was looking to do her wedding in Horniman Museum, we couldn't wait till their wedding day. The bride was looking for a unique wedding bouquet and bridesmaids’ bouquets. She also inquired for an arch at the altar for the ceremony, and green arrangements for the reception, which was taking place in another venue, the Bethnal Green Town Hall Hotel. Emma had requested a lot of Eucalyptus within her personal flowers and the venue floral arrangements. Different Eucalyptus species have a wide range of colours ranging from silvery greys to dark greens and even blue-greens. We played the concept with different eucalyptus species and showcased its hues, forms and shapes to add interest. Some Eucalyptus leaves are circular, others are heart-shaped, elongated or blade-shaped. The Horniman Museum is a unique venue in the beautiful area of Forest Hill and sits in its own curated gardens. Interlacing beautiful landscapes, historical buildings and art exhibitions, the site is a unique place to celebrate a special occasion. Arriving at the Gardens early, we set up an arch within the Glass Conservatory. The elegant Victorian Conservatory stands proudly with a beautiful landscaped backdrop allowing the guests to enjoy the stunning gardens. The arch beautifully framed the couple, whilst marrying stylishly with the Victorian aspect of the conservatory. We used a varied mix of eucalyptus with red proteas for the final touch and to add a subtle splash of colour. Naturally, the arch linked to the bridal bouquet and the other flower arrangements and created a subtle parallel. Once we set up the copper wedding arch, and we arranged the eucalyptus at each row of chairs within the conservatory, we snapped a few beautiful pictures before we made our way to the Bethnal Green Town Hall Hotel to set up the reception room. 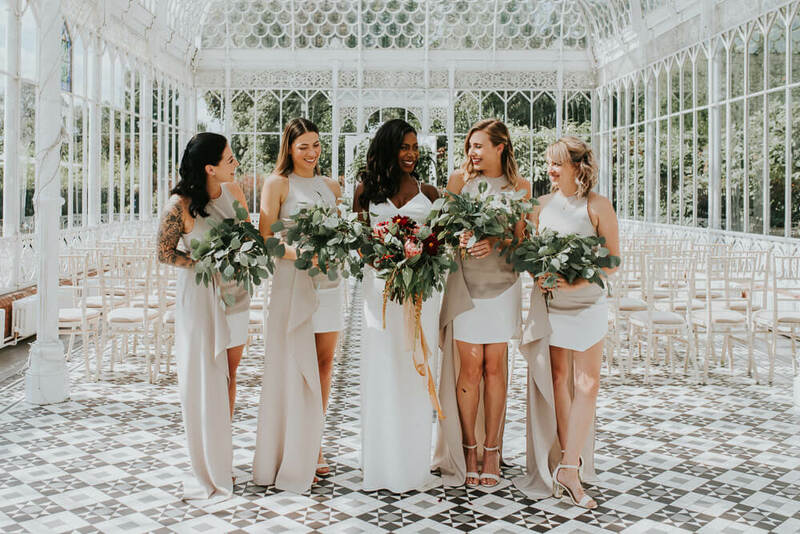 Bethnal Green Town Hotel's wedding decorations were subtle and featured a few types of foliage, including a mix of ferns, eucalyptus, and palms. We placed them in clear glass and gold vases and spread throughout the room to create a green forest feel. If our work caught your attention, fill the form below to get in touch with us. We are happy to answer all of your questions. PS. The great photos is a job of Fern Edwards Photography. Visit her portfolio for more info.